America’s Cup organizers are trying to reach the “Taco Bell demographic” in their continuing effort to grow sailing. That’s according to Bob Billingham, San Francisco event infrastructure manager, who spoke Tuesday at Sail America’s 2012 Sailing Industry Conference in Newport, R.I.
America’s Cup has partnered with Red Bull to launch a youth series, America’s Cup regatta director and CEO of Race Management Iain Murray told the conference. The series will be for 12 to 15 crews between the ages of 18-1/2 and 19-1/2, and the first race will be held between the Louis Vuitton Cup and the America’s Cup final in San Francisco Bay in 2013. The young sailors will be coached by the best sailors in the world, Murray said. The theme of attracting more people to sailing was prevalent at the show. Interactive workshops designed to grow the sailing initiative showed several topics emerging again and again. It’s imperative to “bridge the gap between generations,” said Rod Johnstone, builder of Maine-based J/Boats. By targeting young children and their parents through mentorship programs, more families would become indoctrinated into the sailing lifestyle, Johnstone said. 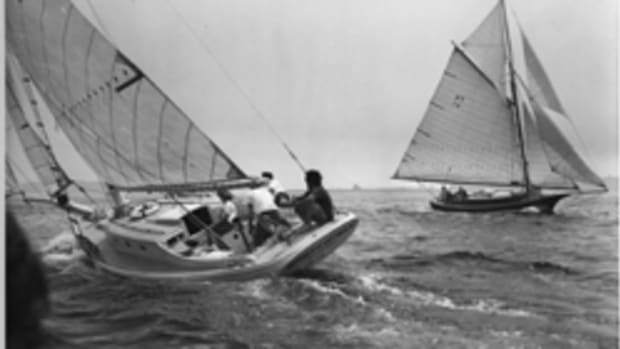 Another prevalent theme was increasing the accessibility of sailing to the public. The groups came up with ideas for changing that, from making yacht clubs open to the public to creating more opportunities for fractional ownership.